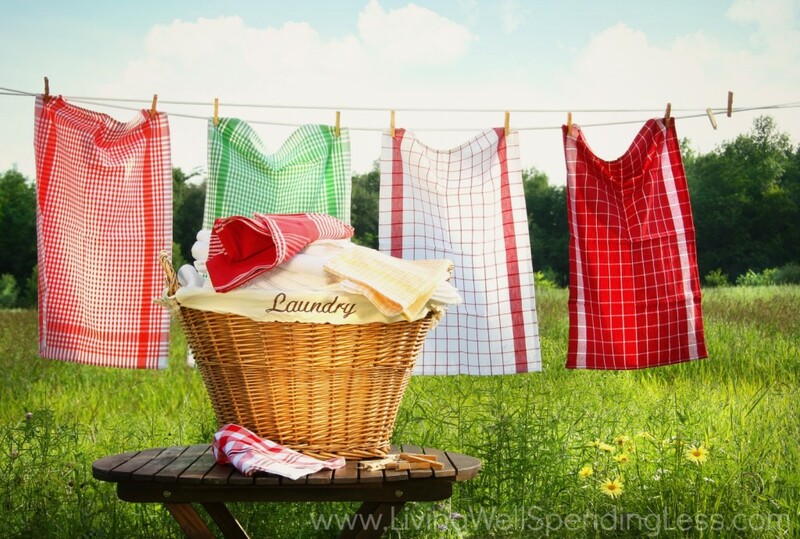 Let’s face it–nobody loves doing laundry! Oh sure, the smell of clean clothes coming out of the dryer is nice, and there’s something satisfying about seeing those piles of neatly folded towels all put away, but how many of us really relish the thought of tackling yet another endless load of dirty clothes? Simplify your out-of-control laundry situation with our amazing Laundry 101 Tips & Tricks. Simply click the button below to get your Laundry 101 Guide delivered straight to your inbox! That said, I realize not all of us have access to laundry facilities in our homes or apartments. Laundry day can seem very daunting indeed if you have to make the trek to a laundromat each week. 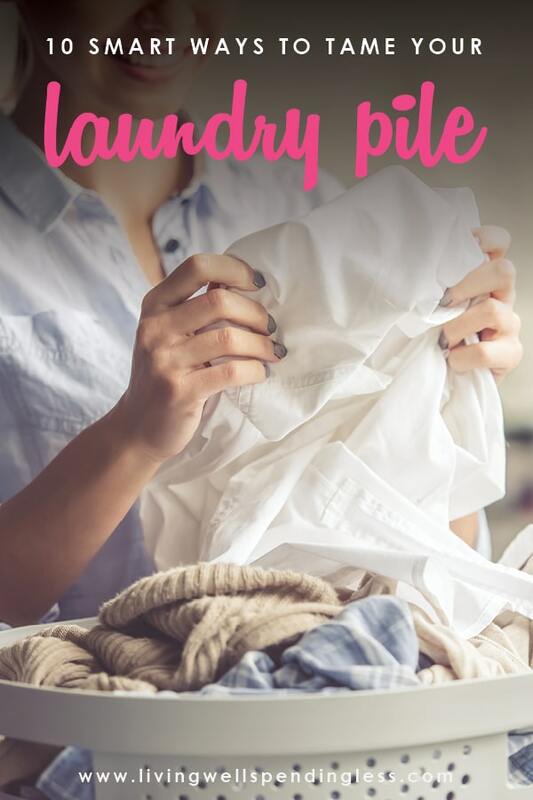 Whether at home or at your local laundromat, using an organized approach and a few tricks can help ease, appease, or at least keep up with that endless pile of laundry. Unfortunately for all of us, that massive pile of laundry lurking in the corner isn’t going to magically clean itself. And so, since we all need clean clothes, it might be time to start figuring out how to make your laundry routine a little bit easier and more efficient, so that you can finally tame that laundry pile, once and for all. 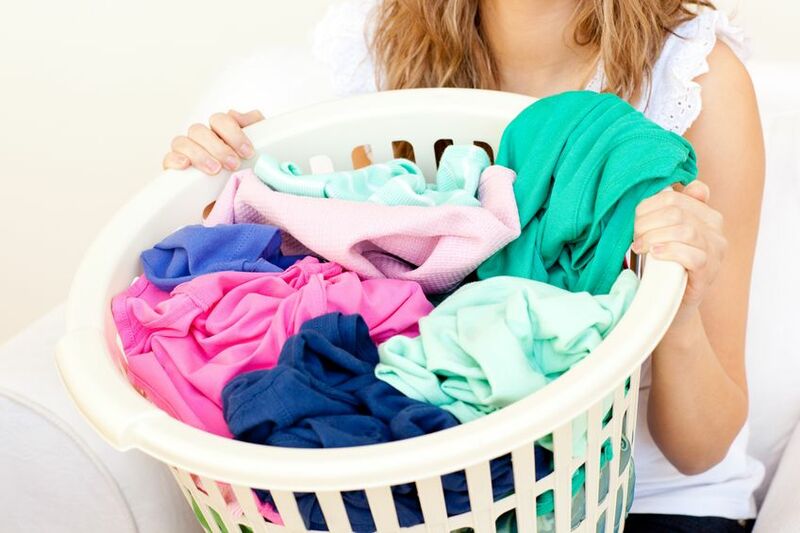 Luckily for all of us, these ten ideas can not only save you some time, freeing up precious hours spent sorting, re-washing, ironing, and searching for socks, but also help make sure your clothing stays vibrant and lasts much longer. This may seem silly at first, but honestly, in our never-ending quest for cleanliness we probably wash things a little too often. Your kid’s pajamas don’t need to be washed with every wear. Your towels can be hung up and reused several times before they need to be laundered. If you wear a camisole under sweaters or undershirts under dress shirts, you probably don’t need to wash something every single time you put it on. Many jeans designers (including Tommy Hilfiger) swear you should rarely, if ever, wash denim. Now, forgoing the wash altogether or freezing your jeans to kill germs might be a little gross, or…extreme…for some of us, but wearing jeans a few times before each wash extends their life and prevents fading. Next time, pause before you toss something into the laundry pile to get yourself in the habit. Ask yourself if it’s really dirty or if you can get a few more wears out of it before you add it to the mountain of wash.
And by the way–this goes for your kids too! Most kids learn early on that it is easier to throw something in the laundry than hang it up, which ultimately creates a lot more laundry than necessary. Teach your kids how to inspect and smell their clothing to see whether it is actually dirty….and when they are old enough, have them start doing their own laundry! As adorable as the outfit might be, hard-to-clean fabrics are not all that practical for anyone, so make a point of buying practical, easy-to-wash fabrics. Not only should you follow this admonition for your kiddos, but follow the same rule when selecting your own fabrics. Suits, dresses, and certainly casual clothing come in easy-to-wash cotton, rayon, hemp or other fabrics that are simple to launder and stay wrinkle-free. There’s nothing worse than fussing over a cute linen outfit all day because you can’t keep it from becoming a wrinkled mess! Do yourself a favor and gravitate towards the practical. When you’re selecting linens for your home, do the same—take a lesson from hotels and buy sheets and towels in white (easy to bleach and keep clean) or a uniform solid color. There’s nothing worse than trying to figure out what to wash a red pillowcase with or finding your entire batch of whites has turned pink! Sticking to practical colors can also end the lost sock conundrum. Yes, it’s less fun, but buying bulk packs of white athletic socks or black trouser socks ensures you’ll never have an odd patterned sock with no match. You’ll save tons of time sock hunting and sorting each week! If your family members can identify colors, they’re old enough to sort their own laundry. 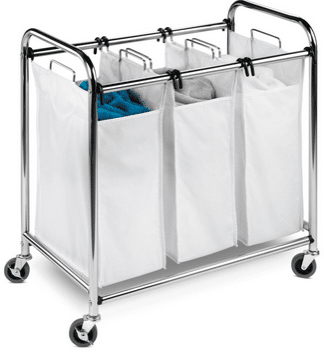 Invest in a sturdy laundry sorter (our family has used this heavy duty triple sorter for nearly eight years & it still looks brand new) or multiple baskets and mark one for darks, one for lights, and one for whites. Sort any delicates, intimates or linens in a separate basket so you can keep an eye on them to be sure they receive the correct treatment and care. Sorting your laundry is the single most important way to ensure your clothing ends up clean and not getting a “dingy” hue. Whites should be washed on hot, lights on warm, and darks and colors on cold to resist fading. When you simply toss everything together, you’ll find yourself with a lot of “grays”—faded blacks, dirty looking whites, and colors that have bled into other colors. Keep your laundry fresh and extend the life of your clothes by properly sorting each item as you take it off. When stains go through the laundry, they set. Once set, a stain becomes a monumental hassle to remove. Your odds of removing any trace of a stain are a lot higher if you manage to treat a stain the moment it happens—before it even has time to dry. Check out my in-depth tutorial on how to remove almost any stain if you need tips on specifics like grass, wax, blood, or food stains. The general rule of thumb is to use stain remover and detergent applied to the back of the stain. Rub gently to remove and then soak in a mixture of Oxi-clean and lukewarm water for 15-30 minutes. Launder immediately after. Always check the manufacturer’s instructions before treating more difficult stains or any stain on a fabric that you might be unfamiliar with. For clothing items that are challenging (red wine on a suede jacket? ), you may be better off to seek a professional dry cleaning service. Show them the stain and ask if the item can be saved. 5. Use a Mesh Bag for Delicates….and Socks! Invest in several lingerie mesh bags—they can be a real lifesaver when it comes to washing delicate items, bras, camisoles, underwear and lightweight fabrics! Not only do they help the items stay safe and protected during the wash cycle (follow the gentle cycle or consider hand-washing if that’s what the manufacturer recommends), but they help prevent delicates from sneaking in the wrong cycle in a pant leg or shirtsleeve. 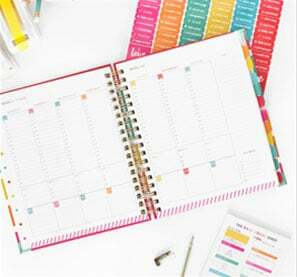 If you need to remember to remove the mesh bag before the items go into the dryer, try jotting down a note on your washer with a dry-erase marker. This helps ensure that “helpful husbands” won’t accidentally shrink your favorite sweater or singe your favorite blouse by tossing the whole load in the dryer to cook. Mesh bags can also help solve the sock conundrum mentioned above. Designate a special bag just for socks and hang it on the side of your regular laundry sorters. Encourage your family members to put socks in the sorter (be sure they unroll them and don’t just toss them in there in a little ball) and you’ll keep track of those sneaky little socks once and for all. Having a laundry area that’s organized and inviting makes a huge difference when you’re tackling your laundry pile (even if it’s just a closet that holds your sorters and detergent until you can haul them to the laundromat later). Keep your detergent in an easy-to-access spot, along with any stain fighting tools you might need, dryer sheets, fabric softener, paper towels, and other important items. Put your iron and ironing board in an accessible spot or hang on the back of a door. Keep all of your laundry “tools” together so you have them on-hand and ready for any sudden stain-fighting crises. Keep your dryer lint-free (a fire hazard) and run vinegar through your washer on a regular basis to keep it smelling fresh and mildew free. These little tricks keep your laundry area inviting. Also, logically, you want to create a “clean space” for clean clothes. If you have gym clothing, sweaty towels, or young athletes who have particularly dirty contributions to your laundry pile, consider a sorter or hamper with a lid and liner to help reduce the smell. Sprinkle baking soda in the hamper and toss a dryer sheet or two in the bottom to keep things smelling fresh. How many of us are guilty of forgetting a load of clothing in the washer? If you’ve ever done it, you know the horrible smell that comes along with this mistake! It can also cause mold and mildew to build up and cause a health hazard to your family. Always change the laundry from the washer to the dryer or remove clothing and hang or dry flat as recommended. Even when it comes to easy, wrinkle-free knits, a day of sitting damp in a washer won’t do your tees any favors. Make sure you’ve allowed yourself enough time to let the laundry cycle through, and get it in the dryer before you forget. Try setting a timer, alarm, or reminder on your phone if your washer doesn’t buzz or if you might be too far away to hear. This will save you from doing double duty and rewashing loads of clothing (or worse, having sour-smelling clothes—ick!). On a similar note—hanging up your clothes straight out of the dryer can save hours on ironing. If clothes sit in the dryer, they’ll wrinkle (and even right out of the dryer, they require a little care). Immediately shake them out and hang them up. Check the seams, sleeves, and other bulky areas for any remaining dampness. If your clothes are a little damp, run the pieces through a shorter dryer cycle. You don’t want to deal with that slight mold smell when your clothes are already hanging in your closet. Today, ironing almost seems to be a lost art. Rarely do women spend their time steaming, starching, and pressing everything. Many modern fabrics actually eliminate or at least greatly reduce, the need to whip out the old ironing board. Still, nothing adds polish and finesse to an outfit like details that are pressed and not folded or rolled. Children’s clothing in particular can benefit from a quick press to the collars, trim and hem to keep them looking nearly new, wear after wear. If you haven’t ironed something recently, give it a try and you might be surprised and the polish that it adds to your outfit. I know so many families whose laundry makes it to the dryer stage and then never gets properly put away, and the truth is, I am very guilty of this as well! Children’s clothing, especially, can end up in piles, or tossed in a drawer or on the floor of a bedroom. What happens then? We end up wearing the same outfits over and over because they’re clean and half our wardrobe languishes in the bottom of the drawer or in the put-away pile. Let’s not let this happen! Keeping a clean, organized closet will ensure you have access to all of your outfits and you can pick from things you love. It’ll save you loads of time in the morning when you’re facing the ever-present question of “what to wear” and save time when putting away the clean clothes as well. Pare your wardrobe down to what’s really important to you and then organize it in an easily accessible manner where you can readily see what you have available and easily choose what you really want to wear. Not only will an organized closet streamline your choices and make life easier, but it will also keep your clothing from wrinkling on the hanger and being smashed into a space that’s too tight. It will save shirts from getting lost in the back of drawers and coming out wrinkled. Keep your delicate from getting snagged by storing them in soft, zipper containers rather than caught in wooden drawers. 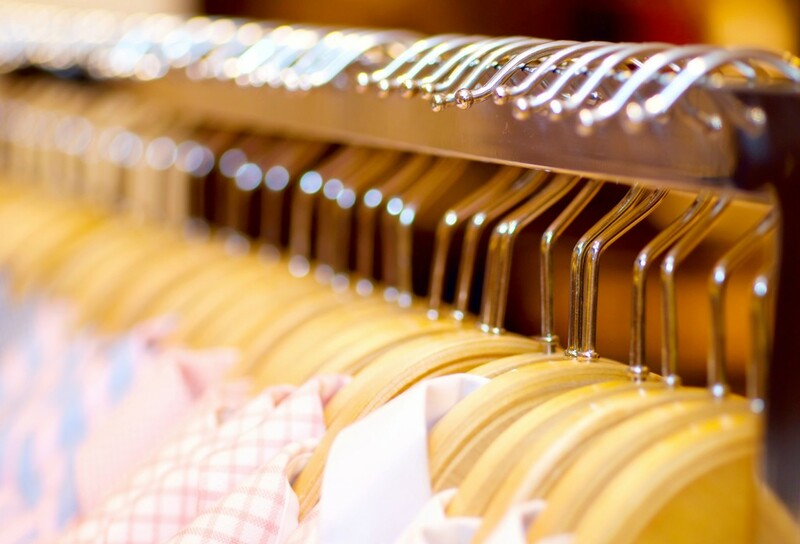 Some items, such as suits, coats, and dresses, simply have to be dry-cleaned. High ticket items or pieces made of high quality fabric may be too expensive and too fussy to be cared for in most home laundry rooms. You can, however, save a bundle on your dry cleaning bill by spot cleaning items as much as possible and by using home dry-cleaning kits, like Dryel to tackle small stains. 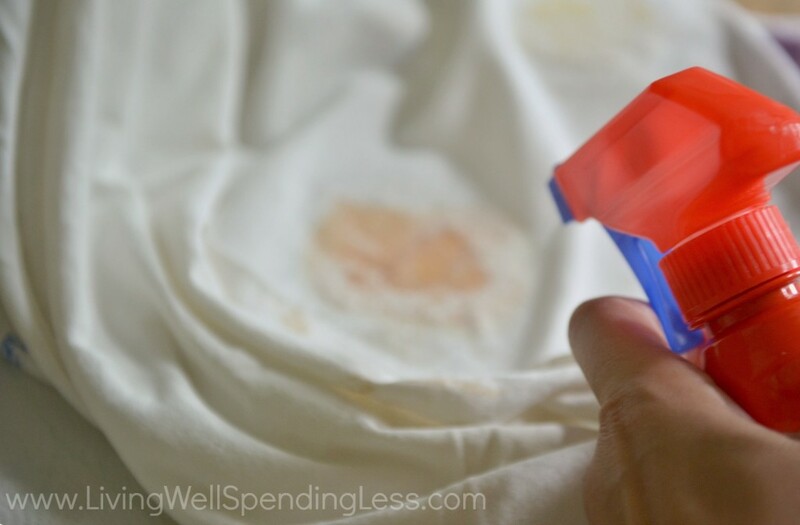 These kits generally don’t remove tough stains, so you should always test fabric in an inconspicuous place to ensure you won’t leave a watermark or damage the area you’re trying to clean. For the most part though, these kits are helpful for refreshing any item. At less than $20 a kit, they can often work on up to 40 items of clothing, which makes the kits a real bargain in comparison to standard cleaning expenses. 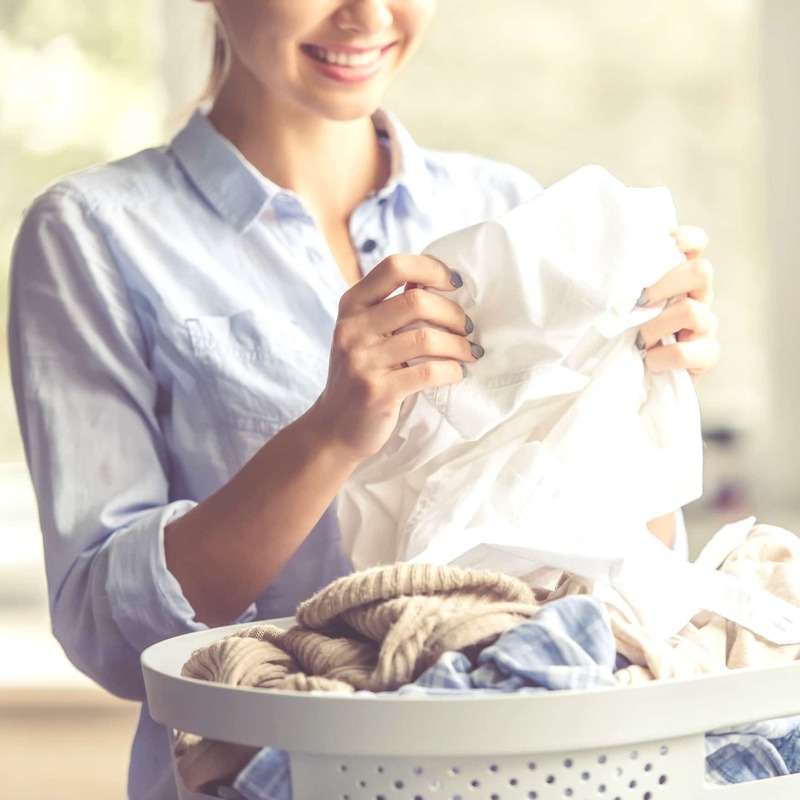 However you choose to tame that laundry pile or scale “Mount St. Laundry,” doing it regularly and finding ways to make it a little easier (okay, and maybe a little bit more fun), can help you stop avoiding laundry day. Who knows—you may even start to look forward to it! My best advice for reducing laundry is to get rid of half your clothes. If you only have 5 pairs of socks you will never fret about finding matches. Works like a charm. For a family of four we do 7 loads a week: lights, colors, darks, towels, kitchen towels/rags, 2 sets of sheets. I totally agree with not washing your clothes unless they really need it (and then definitely wash!). I have a trick of hanging up my clothes until wash day (that way they aren’t super wrinkled going into the wash). It’s amazing how many times I go to get them and realize that they have aired out enough to wear them again. Just like when you travel and have to squeeze a few extra wearings out of garments. I also always wash in cold and use less than the detergent suggested. The last thing I do for things I wear usually is to let them stay in the dryer for ~15 mins to puff out the wrinkles and then hang them to finish drying gently pulling them to straighten seems, etc. Can’ tell you how long clothes last! We have a little laundry bin like the one you pictured only ours has 4 compartments – whites, darks, colors, workout clothing. I try to wash one load a day (if we have one) and then bring up one load that has dried from the basement. We hang dry almost all of our clothing. Years ago, I adopted the practice of never starting a load of laundry that I didn’t have time to finish. Nothing torques me off more than opening the washer and finding a load of damp clothes. I tried to instill this habit into my kids but I’m pretty sure they ditched it as soon as they moved away. I totally agree with you and others who commented here. 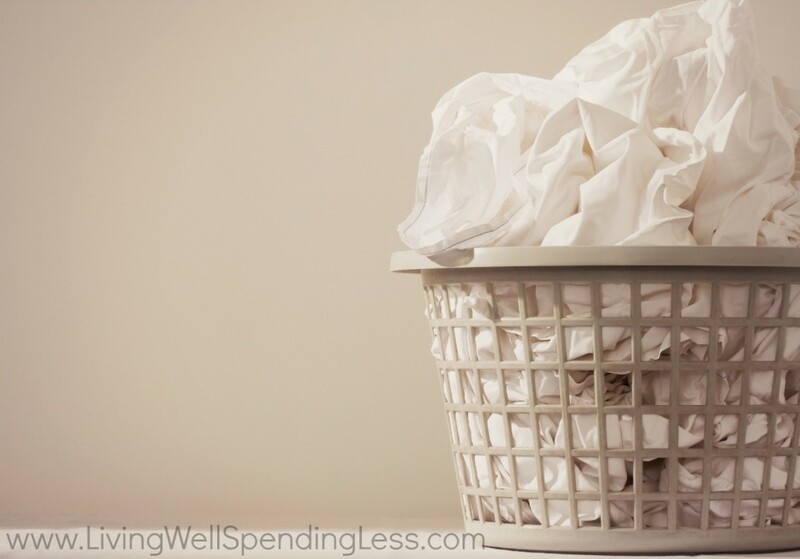 Doing the laundry is a lost art–one I’m so glad that I learned from my mother. She grew up washing all of her 6 family member’s clothing by hand–by the local river bed no less! If anyone knows how to simplify the laundry process it’s her. 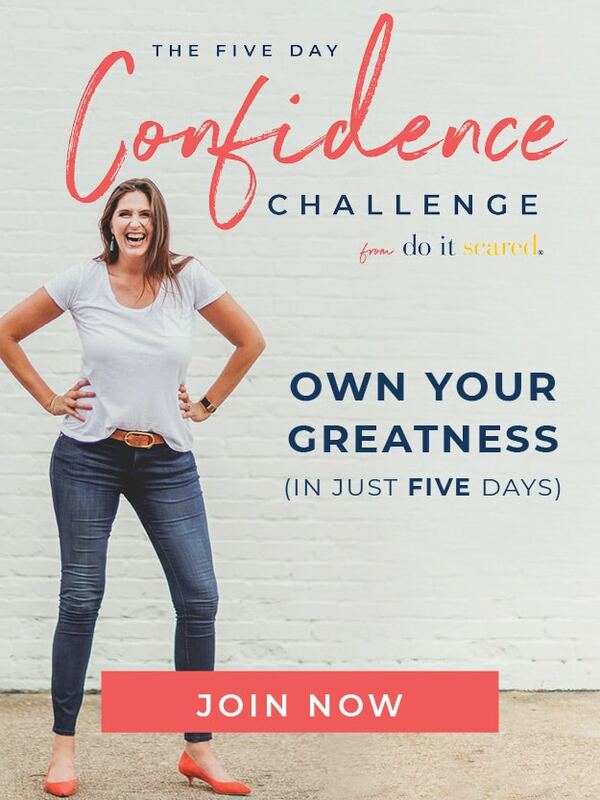 So I find it interesting that all the tips you give here, Ruth, about wearing clothes more than once, paring down the amount of clothes we have, and teaching our kids to sort, are all strategies we can use even now–despite our overflow. Thanks for simplifying what can often seem overwhelming. I hate doing laundry 🙂 Therefore, this information really useful for those who has big family. I want to get rid of half our clothes and hope it would be really easier to do laundry, especially with your advises.